I recently aqquired an altec lansing 1715a mixer/amplifier. This is a well built amp that performs great! When I first got it it needed a few things done. In this page I'll discuss a few problems I had and How I fixed them. 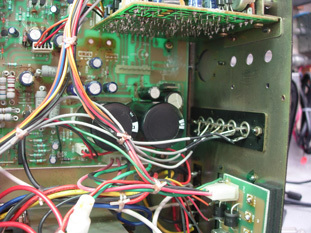 This amp came from a rack mount where it was not properly ventilated. The unit had hum on the speaker and ran hot. 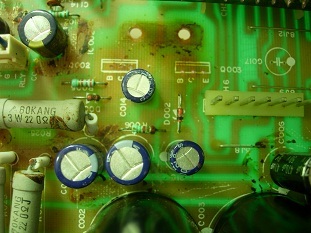 Upon opening the amp I noticed residue near some of the electrolytic capactiors. I propmtly cleaned off this residue with a screwdriver and some Proclean. 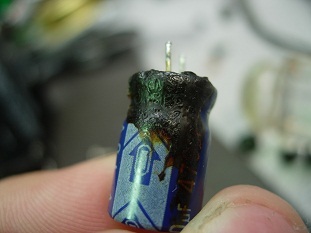 I replaced all of the larger electrolytic capacitors that looked like they had been heat damaged.